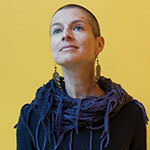 Anna Badkhen has spent most of her life in the Global South. Her immersive investigations of the world’s iniquities have yielded six books of nonfiction, most recently Fisherman’s Blues (2018). She has written about wars on three continents and is a 2017–2018 writer-in-residency at the Tulsa Artist Fellowship, where she is at work on her first novel. In 2018 she was awarded the Barry Lopez Visiting Writer in Ethics and Community Fellowship.